A Tray of Bliss: Swoosh Roses...DIY painted roses and buds.. 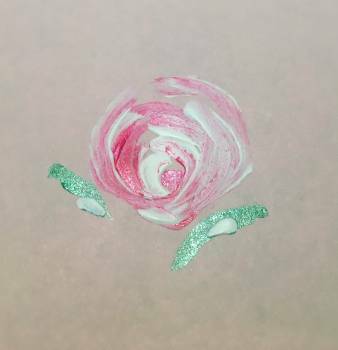 These are so easy, that once you've done a few, you'll be embellishing everything in sight with roses! You need pink or red plus white and green paints. I just used discount store acrylics. You'll also need some small artist brushes. You can buy these inexpensively at discount stores too. One about the size of the pointy end of a pair of scissors. The smaller you want your roses to be, the smaller your brush should be. Plop a few dots of paint onto a palette or saucer, and get a sheet of paper ready to practice. Wet the brush in a glass of water, and squeeze out the excess moisture. Put a bit of dark pink or red on the tip of the brush and mark the centre of your rose. Load your brush with a good dab of pink or red on one side and white on the other. Now, make a C shape, or a swoosh (so named because of the Nike Swoosh, I think), going top to bottom on the left hand side of your dot. Then go from top to bottom of the dot AND the swoosh, on the right hand side. At this stage, it just looks like a pink and white blob. But keep going, adding another swoosh left and right, each time enclosing the previous swoosh. You can then add leaves if you like. Rinse the brush, and squeeze out the excess moisture again, then dip the tip only, into the green paint. Choose a point where you'd like your leaves. It's usually pretty to have them form a sort of V shape beneath or above your rose. Just make a simple sweeping shape, vaguely following the curve of your rose. Add a smaller one on the other side. Make it a bit wiggly if you like. You really just want the hint of a leaf. The same as this is really just a hint of a rose. Load the brush with a tiny bit of white, and add small accents to your leaves. You've just painted a Swoosh Rose! Practice a few more. Each one will be different, and you'll improve as you go along. Don't aim for perfection. As my daughter pointed out to me on the ones I had admired, they are really just little blobs that are representational of a rose. Play with them, and be assured, that there is no such thing as a bad Swoosh Rose. Add leaves, add buds. My rosebuds are just one stroke of pink, enclosed in a stroke of green on each side with a slip of white to accent. And when I look at my old fashioned rose from a friends garden, I think they're a pretty fair facsimile. Paint some and have fun with them. They're gorgeous on cards, boxes, canisters, and décor items of all kinds. The more you paint them, the more you're going to love them. I promise! Oh, those are so pretty! I definitely will try these soon! Thanks for the tutorial with pics! Dear Mimi, I love this instructional post. It shows that we all can make roses too! What a darling post and so well explained! Mimi I remember painting these years ago when folk art was all the rage. They are very pretty on cards. Nice technique! Thanks for sharing. I'm no artist, but you explained it so well I think I can do it! Roses are some of my favorite flowers:) Great tutorial and thanks for sharing at Vintage Charm! Btw, I found you, in Dear Cielo's blog comments.